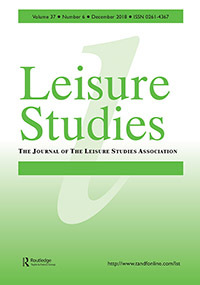 A co-authored article written by Dr. Shintaro Kono (CTR Visiting Fellow / Southern Illinois University) and Dr. Eiji Ito (Wakayama University) has been published in the journal, Leisure Studies. Serious leisure (SL) is a specific leisure experience characterised by perseverance, leisure career, personal effort, durable benefits, unique ethos, and identification with the activity. As it results in self-actualisation and self-expression, Robert Stebbins has proposed that SL does not only increase participants’ hedonic well-being (e.g. pleasant feelings), but also enhance their eudaimonic well-being [e.g. meaning in life (MIL), self-expressiveness, virtue]. Although this argument makes logical sense, it has not been empirically tested. The purpose of this research is to empirically examine the relationship between SL and eudaimonic well-being focusing on MIL. We used data from 207 Japanese and 202 Euro-Canadian middle-aged and older adults collected through a cross-sectional online survey. After multi-group confirmatory factor analysis, multiple mediation analyses were conducted to test whether SL core characteristics impacted MIL or its sub-dimensions (i.e. purpose, coherence, and significance) both directly and indirectly via personal and interpersonal rewards of SL. Results suggested that among Japanese, SL was positively related to MIL both directly and indirectly via SL’s personal rewards. Among Euro-Canadians, the direct link was limited to only a few MIL sub-dimensions, and indirect effects were not significant. These mixed results were discussed in relation to SL, eudaimonic well-being, and culture.